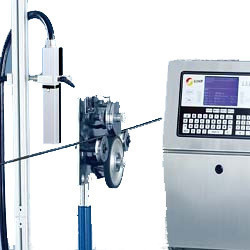 Prominent & Leading Manufacturer from Mumbai, we offer industrial inkjet printer, bottle inkjet printer and cable marking printer. Industrial Inkjet Printer 3 line printer We have been actively involved in the export, manufacture and trade of Industrial Inkjet Printer W300 R. ( 3 line )The offered inkjet printer is a four line, non-contact printer, which efficiently prints the manufacturing and sale parameters on the cartons. Our offered inkjet printer is capable of logo & graphic printing and serial number printing, on user-defined fonts. 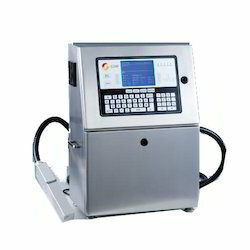 The offered inkjet printer is available in stainless steel cabinet, for sustaining in tough environments. maintenance cost to a great degree. Exquisite and solid stainless steel cabinet Microdot 3100, adopts full sealed stainless cabinet which is in accordance with IP65 grade, is able to work under a tough and complex condition. Excellent ink circulation system 60ml ink capacity reduces waste of ink; Replacement of ink and make-up is simple and convenient with no stop in process. Royal pack Bottle Inkjet Printer 2 line printer - We are one of the well-known exporters, manufacturers and traders of Inkjet On Line Printer. The offered inkjet printer is a diaphragm pump driven printer, to serve as a standalone printing unit. Our offered inkjet printer is widely acclaimed for the four-line printing feature. The offered inkjet printer is very reliable and effective for the printing of batch number, expiry date, maximum retail price, logo and serial number. Succinct Appearance & Delicate Internal. Succinct appearance and small body, much flexible, easy to operate and maintenance unique hydraulic systems design lowest make up consumption. Function & Application Diversity. English menu, edit by any dot, available for logo and graphic print; Message convert, clock delay, shift code, much more than your want; Suitable for a variety of industries like food and beverage, pharmaceuticals, , construction material, electronics, automotive parts, etc. Available in 10x10 packing .